Garam Masala, if you do a search in a dictionary, you will find that Garama means Hot; and Masale means Spices. For the little bit I understand of Indian Cuisine, is that, apart that they cook from their heart, they always have a conscious of their body and the effect the "Masale" have on it. Spices are put together to heal and to give warm to the body, I hear from a friend that was from Banlore? (I don't remember the exact name), that spices were suppose to keep you going. She explain that the old ways including in her home they will change the amount of certain spices from the morning to the night. She said to me, some spices keep you up then those will be lessen at nights. But some other ones have the ability to even take away depression. It was a bit complicated for me but I got the idea. I do not manage the ability to know exactly what to put or not put but i give it a try every time I cook Indian Cuisine. I will Give you here the recipe that is in my book; and so far it had never failed, though, you could also just buy it. Costco sells fairly good spices; also William Sonoma . Garam means hot and masala means spices, and this mixture uses spices that are known to heat the body, such as black peppercorns and cloves. 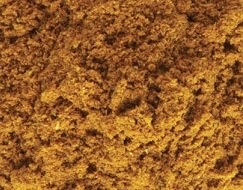 Garam Masala is used mainly for meat, although it can be used on poultry and rice dishes. It is generally too strong for fish or vegetables. 1. Dry-roast the whole dried red chilies, cinnamon sticks and curry leaves in a karahi, wok or large pan over a low heat for about 2 minutes. Karahi Pans are in the general made out of cast iron, they look a little bit like a wok, but they are less conical. Also they remind me of a paella pan, but not for much. Just remember that your best option to replace can be a heavy bottom cast iron pan or pot. 2. Add the coriander and cumin seeds, black peppercorns, cloves, fenugreek and mustard seeds, and dry-roast for 8 to 10 minutes, shaking the pan from side to side until the spices begin to darken in color and release a rich aroma. Leave the mixture to cool. 3. Using either a spice mill or a stainless steel mortar and pestle, grind the roasted spices to a fine powder. 4. Transfer the powder to a glass bowl and mix in the chili powder. Store in an airtight container. I really hope there is someone out there with have adventurous palate, try making your own or buy it. And of course try making some new dishes, i will try to keep up and post all the Indian foods I have tried so far.